Description in Lloyds for both vessels was: 1,700 gross tons, 265 feet length between perpendiculars, 36.5 feet beam, clipper stem, single funnel, three masts, iron hull by John Laird & Company, Birkenhead, single screw with two-cylinder diagonal engines by Fawcett, Preston & Company of Liverpool, giving 10 knots maximum speed. Named after the Emperor and Empress of Brazil. Built for the South American & General Steam Navigation Company of Liverpool, which was owned by the ship builder, for their service Liverpool - Pernambuco - Bahia - Rio de Janeiro. 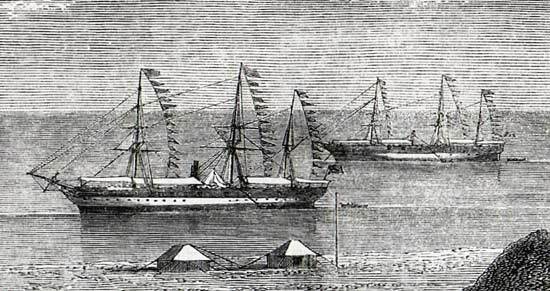 Commandeered by HM Government for use as troopships during the Crimean War, Imperatriz in 1854 and Imperador 1855. Other ships belonging to the line were also commandeered. Chartered by R.S. Newall & Company to lay the Suez - Aden - India cable in 1859. Sold in 1862 to the Compagnie Generale Transatlantique, both ships were initially used on the company’s Mexico service, when the French were supporting the Emperor Maximilian. Imperador was first renamed Tampico and then in 1870 Guadeloupe. Foundered in the North Sea in 1890. Imperatriz was renamed Martinique in 1869. Sold to a Norwegian company in 1890 and renamed Sorrento. Scrapped in 1892. Thanks to Steve Roberts for providing additional information on these ships.